Warm up plays a very important role in an effective workout. Some like to warm up and some just ignore it. Some are unaware of the facts and effects of warm ups. Our body muscles can be compared to rubber bands, which remain compressed when unused. Similarly when we are not doing any physical work, our body muscles are quite compressed and firm. You need to charge them up, if you are planning to hit the gym. If you immediately start lifting heavy weights without any warm up, there is possibility that those unstretched bands may get pulled too quickly and eventually snap. A good warm up benefits you in 4 things- loosen up, get your blood flowing, stretch out and practice the movements you plan on doing. Different warm ups are there for different professional workouts. But here we will discuss some of the steps for dynamic warm up, which is generally very simple and effective for everyone. 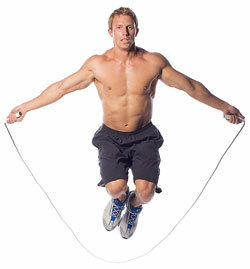 Go for 2-3 minutes of jump rope daily. Initially it may be a problem for managing but will be fine. 20 body weight squats would be sufficient daily. Perform 10 forward leg swings Daily. Perform 10 side leg swings Daily. Like you are stepping over a fence perform 5 sets of hip rotation of each leg. Pull your shoulder blades back, extend your arms and perform 50 jumping jacks daily. Always try to do 10-20 push ups daily. Would be more benificial if able repreat it 2-3 sets.